This site tells the story of the North Irish Horse regiment during the First World War, including its operations as cavalry, cyclist and infantry formations. It is dedicated to my grandfather, Francis Joseph McMahon, whose story inspired my research and is told here. 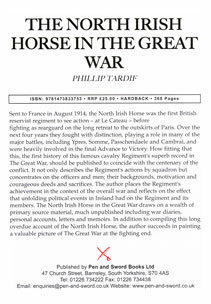 A detailed history of the North Irish Horse can be found in my book The North Irish Horse in the Great War, published by Pen & Sword Military. To purchase a copy click on the cover image below. If you would like more information on a family member who served in the North Irish Horse during the Great War, please feel free to contact me (email address below). A separate site on the 6th (Inniskilling) Dragoons Service Squadron, which served with the North Irish Horse through much of the war, can be found by clicking the Inniskilling badge below. Text of the booklet Memories of the North Irish Horse. 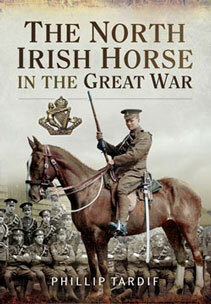 Accounts of the North Irish Horse on the home front. New images of Private James Majury and his King's Certificate of Discharge. New images of Private James Rainey.